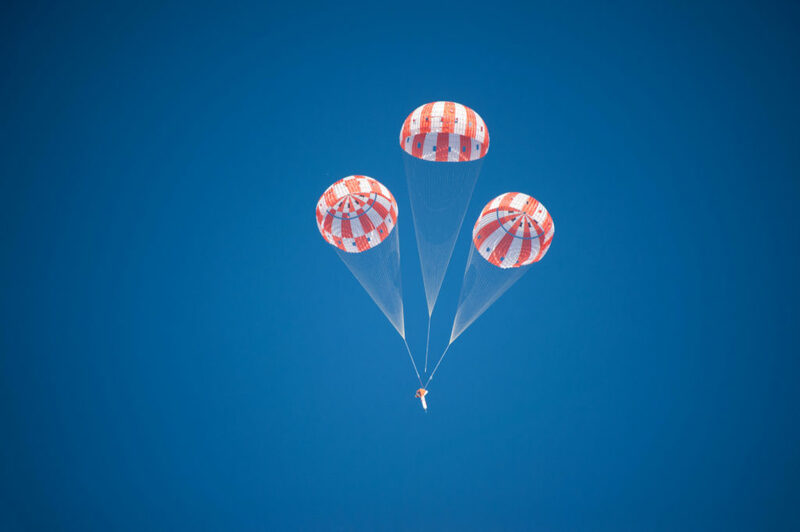 October 5, 2016 – NASA successfully kicked off a series of tests September 30 to qualify Orion’s parachute system for flights with astronauts, a milestone that will help the agency safely return crew to Earth from deep-space missions. In the skies above the Arizona desert, a C-17 aircraft dropped a dart-shaped test article out of its cargo bay from 35,000 feet, or more than 6.5 miles, in altitude over the U.S. Army Yuma Proving Ground in Yuma to examine how the parachute system performed when conditions provided the highest dynamic pressure the parachutes have endured before. As the test article fell from the sky, three small programmer parachutes initially deployed to reach the desired test conditions and were cut away to begin the Orion parachute deployment sequence. Two forward bay cover parachutes deployed to collect key data, and within seconds those parachutes were cut away and two drogue parachutes were deployed to stabilize and slow down the test article. The sequence continued when three pilot parachutes deployed to pull out the system’s three orange and white main parachutes that are used to slow Orion to a safe landing speed. The dart-shaped test article was used because it can get to a higher velocity than the capsule-shaped article typically used in testing. When returning from missions in space, the parachute sequence normally begins at an altitude of 24,000 feet with the main parachutes fully deployed at about 4,000 feet. Seventeen engineering development tests have already been completed. To qualify the parachute system for flights with crew, a total of eight tests, including this one, will be conducted over the course of about two and a half years. A capsule-like mockup will be used for six of the remaining tests, while a dart-shaped article will be used for one remaining test. NASA also is providing parachute test performance data to the agency’s Commercial Crew Program partners. The next test of the parachute system is planned for October, when engineers will evaluate parachute performance when the capsule-shaped test article is dropped from 25,000 feet in altitude. Orion will next venture into space during Exploration Mission-1 in 2018, an uncrewed mission atop NASA’s Space Launch System rocket, and will travel more than 40,000 miles beyond the moon. The parachute system will be delivered to NASA’s Kennedy Space Center in Florida at the end of this year for integration into the crew module for that test flight and will help the spacecraft slow down to a relatively gentle splashdown speed of about 17 mph in the Pacific Ocean after enduring reentry speeds of up to 25,000 mph as the spacecraft makes its way through Earth’s atmosphere. The first mission with astronauts is currently targeted for as early as 2021. Lockheed Martin of Littleton, Colorado is the prime contractor for the Orion spacecraft.